The Professional Regulation Commission (PRC) annnounced on Thursday, June 26, 2014 the list of passers for June 2014 Pharmacist board exam. 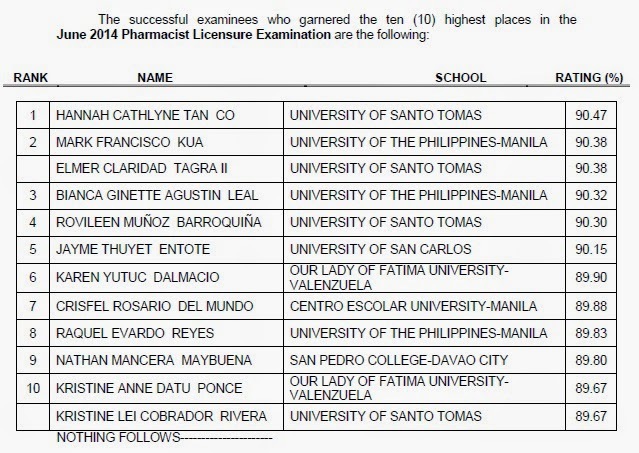 Hannah Cathlyne Tan Co, a graduate of University of Santo Tomas (UST) topped the board with 90.47 percent grade. Mark Francisco Kua of University of the Philippines (UP)-Manila and Elmer Clardad Tagra II also from UST tied on second place with identical 90.38 percent grade.